Since 2009, eculizumab has been successfully used for treatment of aHUS. What happens after discontinuation is less clear. Does the disease relapse? In a recent AJKD article, Ardissino et al review 10 cases of aHUS treated with eculizumab where the agent was then discontinued. Dr. Gianluigi Ardissino (GA), the corresponding author, discusses this important topic with Dr. Sidharth Sethi (eAJKD), eAJKD advisory board member. eAJKD: Can you summarize your findings? GA: In this study, we report the outcome of 10 patients who stopped eculizumab treatment for aHUS with the aim of minimizing the risk of adverse reactions and costs. Disease activity was monitored closely by means of home urine dipstick testing for hemoglobin. During the cumulative observation period of 95 months, 3 of the 10 patients relapsed within 6 weeks of discontinuation. Upon resuming treatment, they immediately achieved remission. Our experience supports the possibility of discontinuing eculizumab therapy with strict home monitoring for early signs of relapse in patients with aHUS who achieve stable remission. 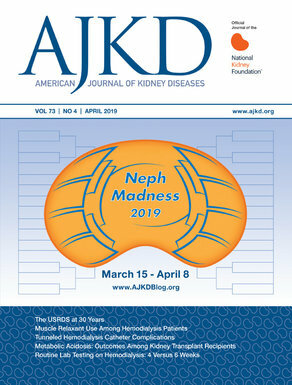 eAJKD: What is your protocol for managing aHUS? Do you perform plasma exchange with eculizumab treatment, or use eculizumab alone? GA: Eculizumab alone is the standard treatment for aHUS at our center, except in cases of kidney transplantation. For transplantation, PEX (150% of PV) and eculizumab are performed pre-transplantation. eAJKD: When do you give these patients meningococcal vaccine? GA: As early as possible, but if necessary, eculizumab treatment is started with antibiotic prophylaxis. eAJKD: Do you feel the urine dipstick is adequate indication of an impending aHUS relapse, and warrants preemptive use of eculizumab? GA: Urine dipstick is a very sensitive tool (less specific) to diagnose aHUS relapse. It does not tell us about impending relapse; it tells us about an actual relapse. We regularly follow patients who discontinued eculizumab treatment or are at high risk of relapse with home urine dipstick. eAJKD: What are your future plans for research in this area? How can we predict a relapse earlier? GA: We want to identify patients at high risk for relapse based of genotype/phenotype correlation beyond what is already known (higher risk in CFH mutations). We need to focus on aHUS due to anti-CFH Ab, and identify alternative treatment options. We are looking to develop a CFH concentrate for CFH deficient patients. Also, we are exploring very early biomarkers of relapse. In aHUS, you can diagnose a relapse early but you cannot predict it. eAJKD: Can we do serial C3 or CH50 measurements to predict an early relapse? GA: I do not think C3 is helpful to predict a relapse, but CH50 and AP50 are very useful to monitor the efficacy of eculizumab treatment and tailor the frequency of dosing with the aim of reducing the costs of treatment and its impact on patient’s quality of life. Interesting study indeed. Looking forward to more on early detection of relapses in aHUS.